We packed up our truck and headed to Austin. I’m going to spare you the whole “What if they don’t like me?” speech. I’m also going to give my wife major brownie points for her encouragement – even while I’m suspecting she wanted to tear her hair out. Our handy-dandy GPS – got us into Austin – by the skin of our teeth in some places – but hey, we made it. Sandy already had all of our locations punched in – including the restaurant where we were to meet the Bold Strokes Books gang. While I was thinking about getting sick from nerves, my wife was jumping up and down in her seat, so excited to be meeting our favorite authors and being in a room full of women. Lesbian women, to be exact. For most of our relationship, we have been the token lesbian couple – to be offered the chance to be at an entire festival of them, she was tickled pink. You have to admire her enthusiasm, right? We walk up to the restaurant doors and my stomach flipped. I’m going to admit – I was immediately star-struck. 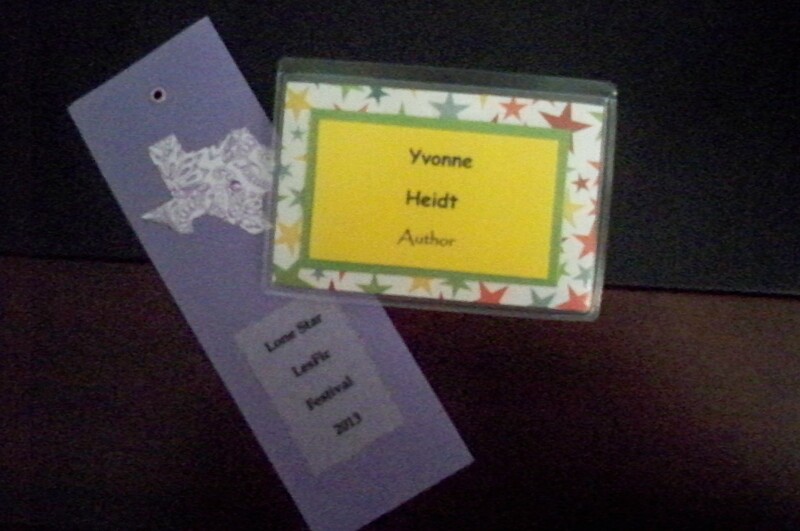 There was a group of authors whose books I have read and admired – live and in-person. Not tiny little avatars on my screen. They were standing in a huddle, waiting for our tables. There was RADCLYFFE! Who is actually my boss. Oh, my God, What do I say? I introduce myself to her and immediately go to the back of the crowd because I’m blocking the door. Before I even catch my breath – Ali Vali! Julie Cannon! Vk Powell! Are you kidding me? Then Carsen Taite hugs me. I had the pleasure of meeting her previously at the Jewel Dallas book club in December. Okay, I’m good. Then I spot Shelley Thrasher and Connie Ward. Two of the warmest, kindest people I have met since I’ve moved here. I’ve lost track of Sandy, but there are no worries there – she never meets a stranger, and everyone always loves her. I hear her laughing already but I’m trying not to trip while walking to our table. We file around and I end up next to Radclyffe. Are you kidding me? I look behind me to see if I’m taking someone else’s seat. My wife is on my other side and the other women are sitting. I turn to Rad, point at the chair and ask her if some one else was supposed to be sitting in it. She graciously told me no, sit down. Let me repeat. Oh, my God. I poke Sandy in the side before she pulls out my chair for me. “What do I say?” I hissed. She grinned from ear to ear and nudged me back. My wife knows I can be charming when I’m not crippled with shyness, nothing like a crash course. Radclyffe congratulated me on being a Lammy finalist. All I can think to myself is “You gave me the chance.” I have lost that conversation to nerves – blocked it from my memory. I think I asked what she was ordering! I’m hoping I didn’t say anything dumb. I’m super grateful I didn’t spill my drink in her lap or elbow her while eating my awesome dinner. Here’s the proof – Radclyffe, Shelley (and me!) at dinner. 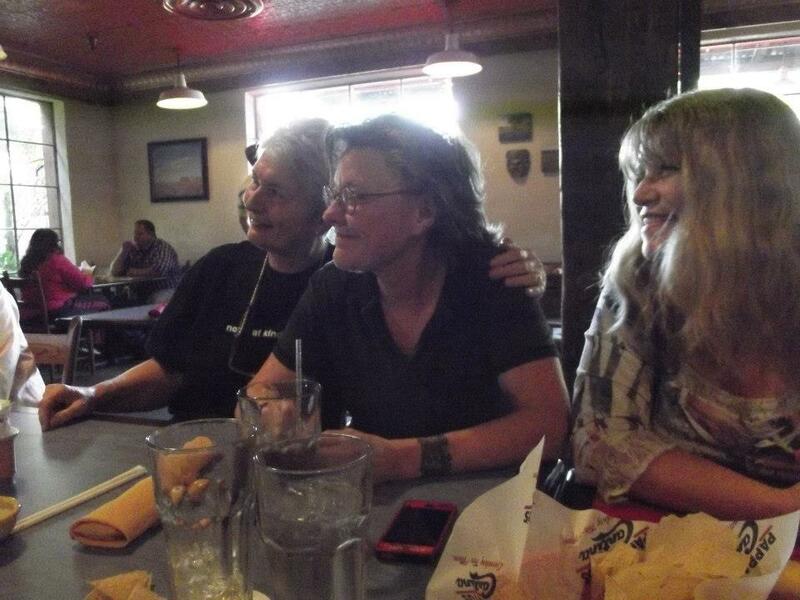 More awesome women, including Stacia Seaman, Melissa Brayden, Barbara Ann Wright (and Russ Gregory) show up during dinner. If I’ve forgotten to list anyone, I blame the king-size Margarita – and you should too. Because I was honored to meet everyone at that table, and I didn’t ask specific permission to list you here in my blog. I appreciate your kind words and the time you all took to tell me that you were happy to meet me. How surreal is that? After dinner, we head to Nature’s Treasure, where the festival was hosted. Can I just say, the ambiance was gorgeous. 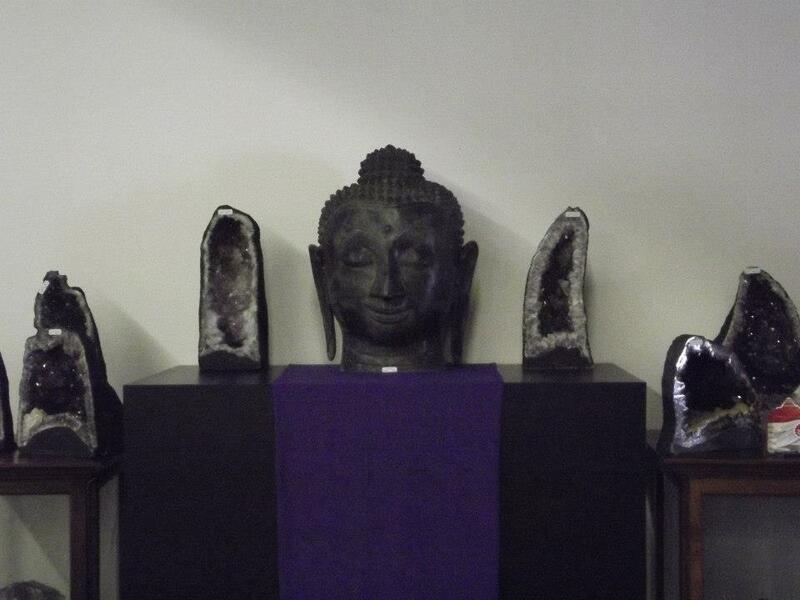 Crystals, boulders of them in all sizes and shapes. I could feel the energy buzzing off them before I even entered the crystal auditorium. My first meet and greet was fun. 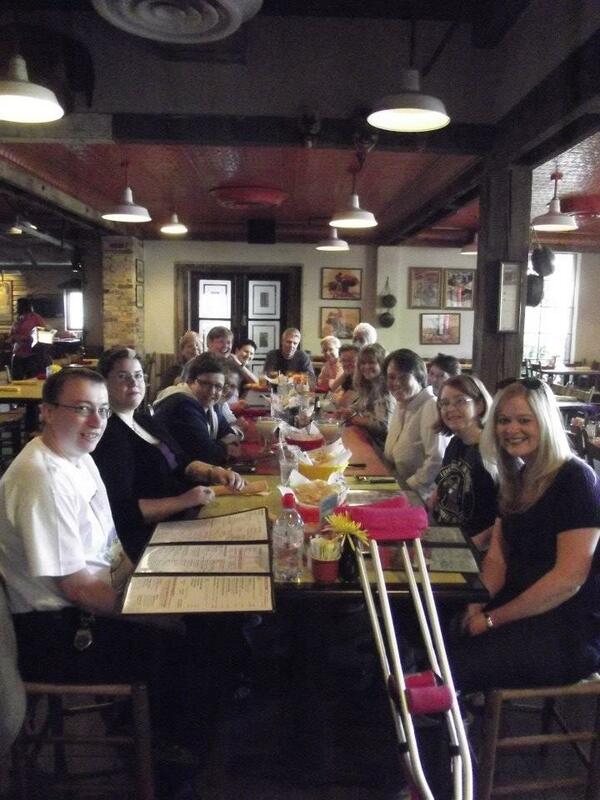 Refreshments and a very warm welcome from the Lone Star Literary Society members. I sincerely hope I thanked everyone personally. Radclyffe did an amazing and slide presentation that evening. 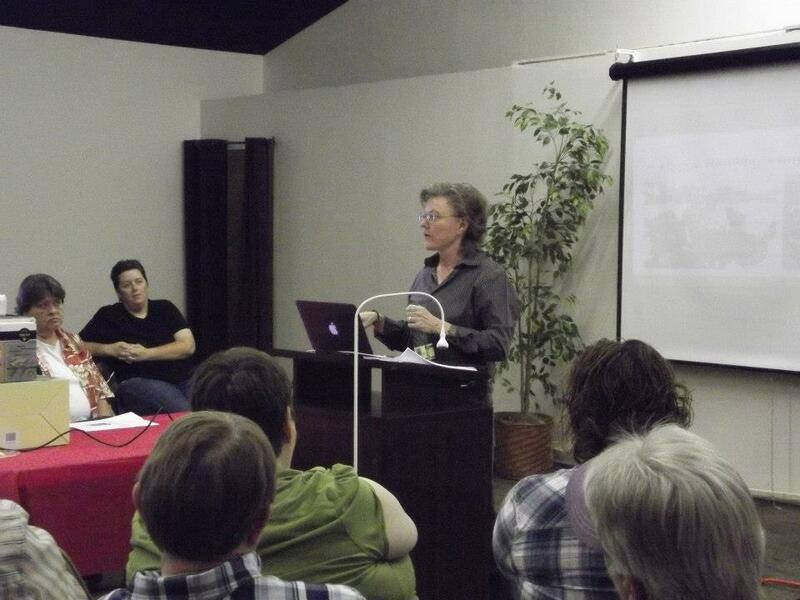 “Fifty Years of Lesbian Fiction: A Personal Journey.” It was engaging, charming, and informative. I had little knowledge of the history of Lesbian fiction and I was impressed and even prouder (if that was possible) to be an author published with Radclyffe’s Bold Bold Strokes Books. Wrapping up here for now, I’m going to save Saturday’s big festivities for my next blog 🙂 I promise the wait will be worth it. I’ll think of a thousand things that I missed on Friday after I post this, I’m sure. It’s part of my charm. Thank you Dawn Williamson for giving me permission to post the pictures you took! I know, right? Thank you so much for all of your love and support – I couldn’t do it without YOU. Wait until I get to Saturday’s stories – ha-ha! Great job, Yvonne. I was really glad to meet you and Sandy. Keep up the good work here at women and words. You crack me up! So glad you had a good time and made new friends. I really did have an amazing time 🙂 Can’t wait to share the rest of the trip. Yvonne–you and Sandy are charming & warm people & I’m so happy you are in our lives & that we live close enough to get to see you more often than most. Yvonne, while I will most likely never get the chance to meet you or your fellow authors in person (I live in Australia) I can imagine that I too would be star struck meeting you all. How special getting to sit next to Rad, wow can I shake your virtual hand? I am eagerly awaiting to hear about Saturday. Welcome to the BSB family of wonderful authors. I look forward to maybe meeting you one day then. Great blog, Yvonne and glad you had such a wonderful time!